SUNY Buffalo State President Aaron Podolefsky introduced a new college crest Wednesday, January 30, revealing a bold mark that embodies the institution’s academic mission and dedication to excellence. The new crest mark, which replaces the Buffalo State typeface logo, will now serve as the institution’s official logo. The crest is available to the general campus and news media in a family of three configurations (circular, horizontal, and vertical) to suit a wide range of applications. “Elements of the new crest aptly capture Buffalo State’s academic excellence and build on our historic significance in higher education. Its look visually evokes a message of educational vibrancy that remains a central tenet of our institutional mission and vision,” said Podolefsky. The focal point of the new crest is Buffalo State’s Rockwell Hall clock tower, which is a well-known icon in the city of Buffalo. Since its founding in 1871(a date that is inscribed on the crest), Buffalo State has been a public institution with a public purpose. The crest, which is flanked by leafy golden branches of an elm tree, features a banner that reads “Dedicated to Excellence.” These words are drawn from a larger phrase in Buffalo State’s mission statement: the college is dedicated to excellence in teaching and scholarship, cultural enrichment, and service. The process for developing the new institutional crest mark began in spring 2012 under the direction of President Podolefsky. An initial draft was shared with the College Senate last spring with input and feedback received in the fall from the campus community. In addition to the new crest, President Podolefsky has announced a change to the institution’s official short name—which has been approved by SUNY Chancellor Nancy L. Zimpher—to “SUNY Buffalo State” or “Buffalo State” to better align with campus identity and communication efforts. 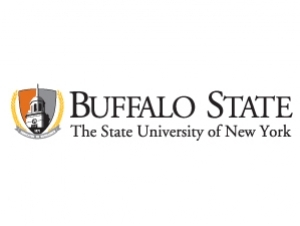 The change enables the institution, previously referred to as “Buffalo State College,” to better identify itself as part of the State University of New York system, one of the most recognizable brands in public higher education. The new crest and name will immediately be incorporated into the college’s “Because of Buffalo State” marketing campaign, which launched in 2011.